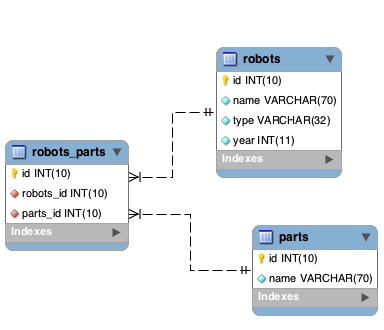 In the above we have a `Robots` model which has three properties. A unique `id`, a `name` and a `type` which defines what this robot is (mechnical, etc. ); In the `Parts` model we also have a `name` for the part but also fields that tie the robot and its type with a specific part. **NOTE** The field mappings in the relationship are one for one i.e. the first field of the source model array matches the first field of the target array etc. The field count must be identical in both source and target models. Phalcon uses the magic methods `__set`/`__get`/`__call` to store or retrieve related data using relationships. If you alter a `belongsTo()` relationship to act as foreign key, it will validate that the values inserted/updated on those fields have a valid value on the referenced model. Similarly, if a `hasMany()`/`hasOne()` is altered it will validate that the records cannot be deleted if that record is used on a referenced model.